There are plenty of reasons as to why Liverpool is known for being a very popular tourist destination. Apart from housing two very famous football clubs, the city of Liverpool is also known as a major port and is the home of The Beatles and Gerry and the Pacemakers. Whatever your reason for visiting Liverpool, you should travel in comfort and ease, especially if you are planning to visit the city with friends. If you are not familiar with the “ins and outs” of Liverpool and you would rather appreciate the sights than waste time asking for directions, it may be a good idea to hire a minibus in Liverpool to help you get around easily. There are many companies in the city that will enable you to hire a minibus in Liverpool at reasonable prices. Bank View Hire Ltd - Established in 1966 this is one of the longest-running minibus hire businesses in Liverpool. Arnold Clark Rental – This is one of the largest car hire companies in the UK with numerous depots all over the kingdom. Its Liverpool branch is a favourite with the locals because of their affordable rental rates. A & A Travel Liverpool – This company specialises in renting out minibuses for airport transfers, race days, and golf trips. Maghull Coaches - Planning a corporate or class trip? Maghull Coaches will not only provide you with a minibus and a chauffeur, they can also organise your itinerary. How long do you want to hire the vehicle for? 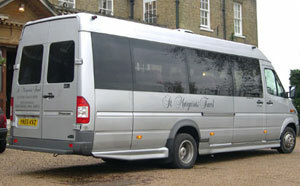 Do you want to hire a regular minibus or a luxury minibus model? Would you like a driver or would you prefer a self-drive arrangement? Where do you plan to depart from and where do you want to return the vehicle to? It is difficult to give an exact quote as to how much a minibus rental in Liverpool would be due to the differences in rates per company and your requirements. For an individualised quote, why not contact some minibus hire companies and see who is the most affordable whilst at the same time meets your needs. The most hassle-free way of finding a minibus rental company in Liverpool is to ask family and friends who have hired a minibus before with a local rental company. However, if you don’t know anyone who can provide you with this information, you might want to speak to the representatives at your local tourist agency or look in Liverpool travel magazines. Liverpool is the perfect place to visit, either for pleasure or for business. Make the trip easy and convenient for you and your friends and hire a minibus in Liverpool. This way you can enjoy what the city has to offer at your convenience.